The better news? In honour of One Hundred Thousand, we're going to give one of our blessed readers some new reading material...for free...like, you don't have to pay for it. We randomly choose your number, and you get a most exciting package in the mail a few weeks later!! How's that for this rainy (yet warm) Monday morning in almost-May? I see you straightening up in your seat...anxious to know the details so here they are. This book is such a cute read, and has great advice for the average gal (according to the wisdom of Jane Austen), like how to recognize men who are "just not that into you" and how to conduct yourself rightly, with delicacy towards the feelings of others. It really is a gem, and inspires the reader to better manners and greater refinement. Very much like the first book, but totally different style of writing - yet seriously enjoyable. 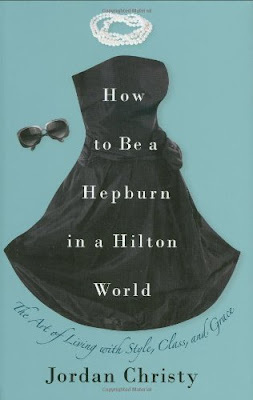 How to be a Hepburn in a Hilton World practically explores living with style, class and grace and what that means for us in 2013. Jordan Christy is funny, sassy and entertaining. (ok, I liked how she gave you quizzes through the whole book to figure out everything from "what's my style" to "which kind of book is best for you.") 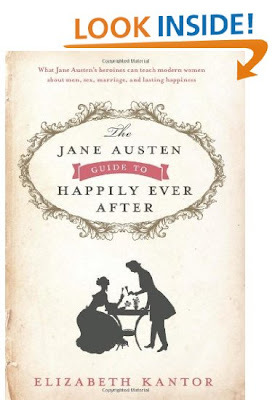 An overall quick and easy read that like the Jane Austen Guide, helps a lady be more lady-like in her everyday life. SO - by now I imagine you're squirming for the details - what do I have to do - you're asking yourself. In our comments section, leave your name and tell us your favourite Feminine Gift article. We will choose a winner by random draw on Sunday, May 5th and we will post the winner Monday Morning. If you leave a link to your blog, we will notify you on your blog as well (because we will need an address to send these books to...). GOOD LUCK LADIES (AND GENTS)!!! Oh! How exciting! New books! I love giveaways, and I guess I don't enter enough of them because so far I haven't ever won. Keeping my fingers crossed! So many good articles, but right now the one that keeps coming back to me is the menu planning...I need to start doing it again! Good work! This is an amazing blog! I just discovered it. While looking through the articles, the one on the interview with Alice Von Hildebrand caught my attention. Thanks for having this giveaway. Both books sound wonderful! There have been lots of great posts but I'd have to say my favorite is How to Be a Saint, about doing little things for God. My favourite is "The Perfect Relationship" from December. Thanks for the giveaway! Great idea! Our favourite post is Dynamic Women of Faith! I have never entered a giveaway, but you had me at Hepburn. A secret (which won't be that anymore now, will it?) is: I used to be compared to Audrey a LOT in my youth. But I don't say that to people who know me in person... because I wouldn't want to see their puzzled faces (let's just say this was many years and pounds ago). While I'm "of an age" to perhaps not "need" these titles per se, I know I'd enjoy them and I know just the young women to then pass them along to ... so I'm "in." You've done so many posts I love. But Spiritual Direction 101 was so solid and good that I give it the vote. And my blog to leave things on is thebreadboxletters.blogspot.com May Our Lady pick the lady to send these to! Ahh, such a tough decision, to just choose one post-they are all so great! I really liked the one about 'the mall'. I think part of the reason I liked it so much was because I know exactly what your saying and I can relate! Thanks for all the beautiful and inspirational blogging you ladies have done! I love a blog give-away! How fun! :) I have several pieces I really, really enjoyed from your blog but the one that comes to mind to me right now is "The Spiritual Side of Abortion." My husband works full-time in the pro-life movement, and so I tend to compartmentalize the issue of abortion, perhaps as a coping mechanism for how upsetting it is!, into 'work' and not a cause for which I am called to pray and fast. I would love either of these books. Fun, summery and light-hearted. Thank you for encouraging and inspiring words! Wow, a blog give away:). Those books sound wonderful, can you still enter if you do not have a blog? I will be honest, I agree with many of the other posts... it is hard to choose just one post. I really appriciated the one in which you summerized you talk, "Dynamic Women of Faith: what is the feminine gift and our hope for women," for I found that in many ways it sums up your whole reason for blogging. I'm going to go with "How I Met My Husband" -- so much wisdom and insight. I have to go with anything related to the Dynamic Women of Faith conference. I attended it this year for the first time, and it was such an incredible day! I had heard about your blog prior to the conference, but have become a regular reader ever since I heard you speak there!